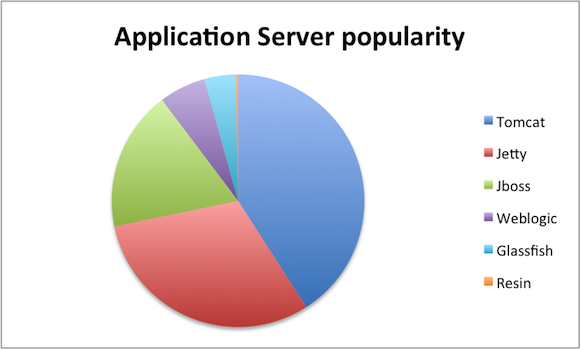 It is now a bit more than a year from our 2013 insight into application server market share. To verify whether the landscape has changed during the 14 months we went through the 783 different configurations launching On Demand Plumbr between February and May 2014. The data was gathered from the bootstrap classpath – so the following statistics is based upon the outcome of queries similar to “grep -i tomcat classpath.log”. What we see here is that Tomcat is still leading the pack. 41% of the deployments are using Tomcat, well aligned with the data from 2013, where our studies gave Tomcat a market share of 43%. Next in line are again our usual suspects – Jetty and JBoss/WildFly. Jetty is holding the second position with 31% and JBoss/WildFly is third with 18% of the applications. There is a visible difference in Jetty marketshare – last year 23% of the applications reported themselves to be hosted by Jetty, translating to 8% market share gain within a year. JBoss, even though now coupled with its younger brother WildFly also managed to hold its position, up a two percentages from the 16% reported a year ago. The WildFly is still in early adoption phase, as we had just nine environments running on a WildFly container. 4th and 5th place have switched places comparing to the data from past year. Weblogic with 6% and Glassfish with 4% do seem to have a small but loyal user base. Last and barely visible from the graph are the two lonely Resin installations. 38 contained references to desktop APIs, such as jgoodies. It still leaves us with 62 environments we fail to classify, but statistically speaking, the Java world has not changed overnight. Focus is still upon Java EE deployments. When we compare our results with other studies about the Java EE landscape, we see some differences. For example Jetty marketshare in our user base is significantly higher than other market research sources can verify. I can only link the differences to the nature of our dear users – Plumbr by being a rather young service is used by a slightly different audience than more mature tools. All in all, the results are encouraging to all the fellow Java system administrators out there. The days of wrestling with the Big Boxes from Large Vendors are left to 2000’s and the tools of 2014 are a lot more friendly to set up and maintain. If you found the study interesting – follow us in Twitter or RSS, we keep publishing our insights about Java internals. Indeed. During the three months this statistics is from there has been exactly zero WebSphere runs. To be honest, last month of this we did not even officially support it, but throughout 2014 we have had a single WebSphere trial run. Which was also the main reason behind removing it from the supported platforms.